As most of our club members are aware, positions on our board of directors are temporary, with each director elected for a term of three years. Our President Rob Bertazon will be leaving his position as President as of January 1st 2015. We are fortunate to have two club members who have offered to serve on the board starting in 2015. As a result, the nominating committee has put Mike Ahlfeldt and Ralph Davis on the ballot for election to the board. Holden Wolf, Chad Wisner, and Walt Marchant will remain on the board for 2015. If there are any other members that would like to serve on the board, please respond to this notice, so we can include you on the ballot for election to the board. There is an online Ballot available to members. Simply logon to this website. Under the Members Only heading is a link to the ballot. The final regular season tournament is complete. Prettyboy posed a special challenge with bluebird skies and a BIG temperature drop the night before. To the teams of Bertazon & Broadwater, Gordon & Wolfe, and Godwin & Walker: You all put forth an Excellent effort on a very tough day. Well Done! It was a revealing day to Max and me. We lost our bow-mount motor nearly 3 hours before the end of the day, forcing us to control the boat with the main motor. Max fishing from the bow, and me driving from the console. That's team fishing! During this time, we found a pattern that worked well, but it was too late in the day to get the job done. If we identified that pattern an hour earlier, it would have made a big difference. We put 4 keepers in the boat for 14th place. Lessons learned from this season are numerous. Four important lessons are: We need to put more time into practice next year. We need to improve the quality of practice with better electronics. We need to fish to win rather than fish to fill a limit. There is a significant distinction between the two approaches. Finally, always be open to learning. MRA is a great club. I truly enjoy the group and strongly encourage anyone interested in joining us to reach out to us. Come to the meeting next February. Read more about The 2014 Campaign, End of the road. Loch Raven is in the books. It was certainly the toughest day on Loch Raven that I have witnessed, with only 3 limits from 24 boats. Max and I finished in 11th place with 3, count-em, 3 fish for 8.48 Lbs. The best positive that I can take from this tourney is that the tournament was won on the exact spot that Max and I identified in practice as our primary location that we wanted to fish for this tourney. We just couldn’t get to the spot fast enough. A couple of great fishermen arrived first and spent a very productive day there. Congratulations to Rob and Ron! Note to self: get a bigger motor (or two) or identify more productive spots next time. Prettyboy is next. I sit in a Chicago hotel room having not fished Prettyboy since our last tourney there. I have received two Prettyboy practice reports from Max, who put a lot of effort into searching the reservoir and developing an approach for the last tourney. As always, we will fish hard and try to make the best decisions we can. I know we’ll have fun and grow as fishermen, whatever the outcome. 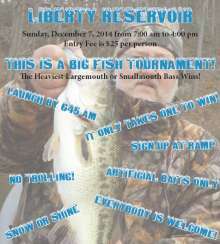 Well, this entry will be short, like most of our fish at the 4th tournament of the season. Liberty was a bit stingy for us. Max and I had a small limit by 8:30 or 9:00 AM. We worked our plan, made some moves and just couldn't get into the bigger fish that we found in practice. Several small upgrades throughout the day only added ounces to our total. We lost two fish that would have moved us up the leaderboard a few spots, but that happens to the best of them. I haven't been to a weigh-in in the past 5 years without hearing several "the one that got away" stories. At this point, we need to swing for the fences to make the TOC. A win will do it! Loch Raven tomorrow, with no practice week in between. This will be interesting. I must be crazy, but I am really looking forward to the challenge. Tournament fishing really gets into your blood! Congratulations to the top performers in this tournament, Matt & Al with 29.66 lb, Butch & Larry with 24.27 and Davis & Spera with 21.61lbs. Fantastic effort! As for Max and me, it was good team effort. Unfortunately, this was only my third time on Liberty this year and the second for Max. This put us at a big disadvantage, as the vegetation has changed a lot since last year. We were fortunate to have a small limit before 7:30 AM. It’s interesting how an early limit changes ones fishing perspective, allowing us to fish very hard but in a more focused and un-rushed manner than if we were chasing a limit all day. The bite slowed dramatically for us by 10:00 AM, but we fished our plan and made some adjustments throughout the day, leading to Max catching two good upgrades. We had our final 8 fish, 18.26 lbs, limit at 12:30 PM, with two small (easily upgradeable) fish in the livewell and 3.5 hours to fish. Unfortunately, there were no upgrades to be found. Finish place was 9th. Team Marchant & Marchant has a lot of room for improvement, but Fishing MRA helps us enormously. We look forward to future tournaments.